It’s so easy to ignore your garden through the cooler months. Most of us aren’t spending much time there, and it’s not exactly the entertainment hub in through winter. So, it’s not surprising that the panic sets in when the sun starts to heat up a bit and your ‘winter garden’ becomes a ‘spring eyesore’. Particularly if you’re thinking about selling. Rest assured here are a few simple tricks to refresh your garden without a major overhaul, putting it in great stead for showcasing. It’s so easy to take a look at your garden, see only weeds, spend a couple of hours randomly weeding a spot in your garden that ‘looks achievable’ only to lose all momentum and head inside for a cuppa. In reality your garden doesn’t need to be weed free – it needs to be cleverly weeded. Start with your front borders, and think about where your eye travels. The first metre into a garden bed is the most visible so aim to tidy that first. Weed and spray paths and cobbles so there is a clean line between where the garden ends and the path begins. The difference you’ll make in a couple of hours will leave you simply ecstatic with your progress – and more likely to continue! A vibrant green lawn is awesome – and a real selling point. If your garden is less that lush you don’t need to rip it up - the right combination of spring feeding and weed control (all packed into one product these days) will add the ‘green green grass of home’ to your garden package. Don’t be tempted to mow it down to the quick – as the warmer weather approaches this puts stress on the root system. Set your mower to mid height (or ask your lawn guy) and mow more frequently to encourage lush new growth that will pop in photographs. Side note: having a fabulous lawn detracts from any other weird parts of your garden. You want something that will put a smile on your face and says ‘we love this home and so will you’ on open day. Want to get some spring colour into your life? Easy – pop a pot or three on your doorstep or deck. Head down to your garden centre, have a look at the ‘seasonal potted colour’ stand (you can’t miss it) and then choose a wildly eclectic mass of colour (or a perfectly matching selection) – to suit your personality. Plus, potted colour photographs really well, so your real estate agent will be happy. Easy. I tend to liken the state of our gardens in winter to the state we can get into ourselves – a bit neglected, lacking in nutrients and overgrown in places. So, like us, the garden is ready for a healthy feed and it needs your help! But don’t worry about getting flash – a big bag of sheep pellets and some good quality mulch thrown through the beds is all you need to get that garden looking sharp for the warmer months. Lush strawberries flowing over pots or in garden bed spell ‘home’ to new buyers and it’s time to plant. The rule of thumb (apparently) is 4-5 plants per person living at your place (or likely to hang around lots) – so you might need a few. They can be planted anywhere that is sheltered and sunny - so in your garden borders, or overflowing from pots and when the fruit arriving you’ll be showing off that ‘edible garden’ element buyers love to see. Perhaps most importantly enjoy your spring garden – discover the new buds, welcome the birds arriving and bees tending their crops. Take some time to celebrate new beginnings and fall back in love with your garden. It will pay you back tenfold! 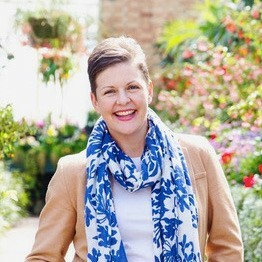 Kate is the founder of Kate the Gardener Ltd – a multi award winning garden care and design company based in Auckland, New Zealand. Filled to the brim with a growing crew of garden superstars, Kate and her team are on a mission to help homeowners fall back in love with their gardens with a combo of DIY advice, a tonne of garden experience combined with good old-fashioned elbow grease and plenty of fun.